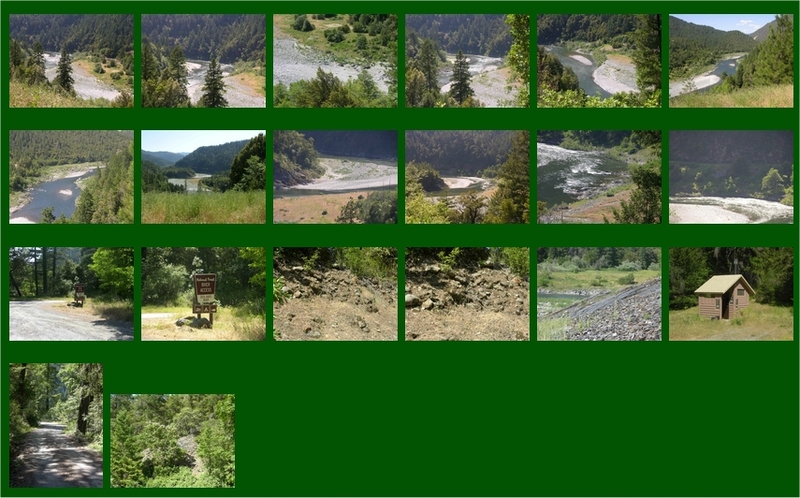 The Two Mile Bar dredging claim (on the Klamath River) is located approximately 1 mile upriver from the town of Orleans. 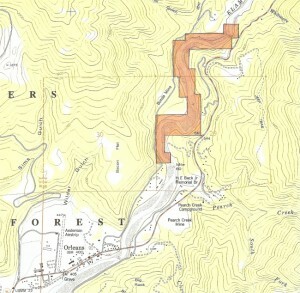 The upriver boundary is located approximately across the river from Highway 96 mile marker 41.20 (see map). Some private property exists between the highway and the river along this claim. There is excellent access on both sides of the river near the lower-end of the claim. Another road follows along the claim on the far side of the river. 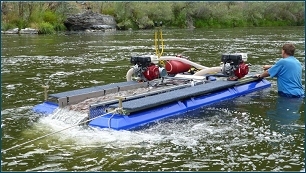 Access can also be made at the USFS Dolan’s Bar River Access. There, a boat may be launched allowing access to the entire claim. At the bottom of the Dolan’s bar access is a huge hydraulic area with excellent camping. A USFS toilet is located there, as well. This gold dredging claim is just upriver from the town of Orleans where you will find most amenities you may need, including: laundry, gasoline, water, groceries and RV hook ups. Prospects: This entire area has a very rich mining history which can still be seen today in the form of large cobble and tailings piles. Looking closely around some of the cobble piles reveals that they were placed directly on top of virgin streambed material that has never been worked. Sections of ancient virgin riverbed are still in place, sitting right on bedrock on many of the bench areas of this terrific gold dredging claim! These old streambed deposits should produce excellent highbanking results. Many other extensive highbanking prospects exist in hard-packed streambed all along the riverbanks. The possibilities for finding gold nuggets with metal detectors are very good in the hydraulic areas. Three sharp bends in the river are visible from the road on this claim, creating excellent dredging potential. It is reasonable to believe that the large hydraulic areas located nearby have contributed gold to further-enrich the riverbed deposits. There are shallow-water areas with exposed bedrock, and numerous gravel bars. At just over two miles, this claim will provide a lifetime of fantastic dredging for a small mining team.